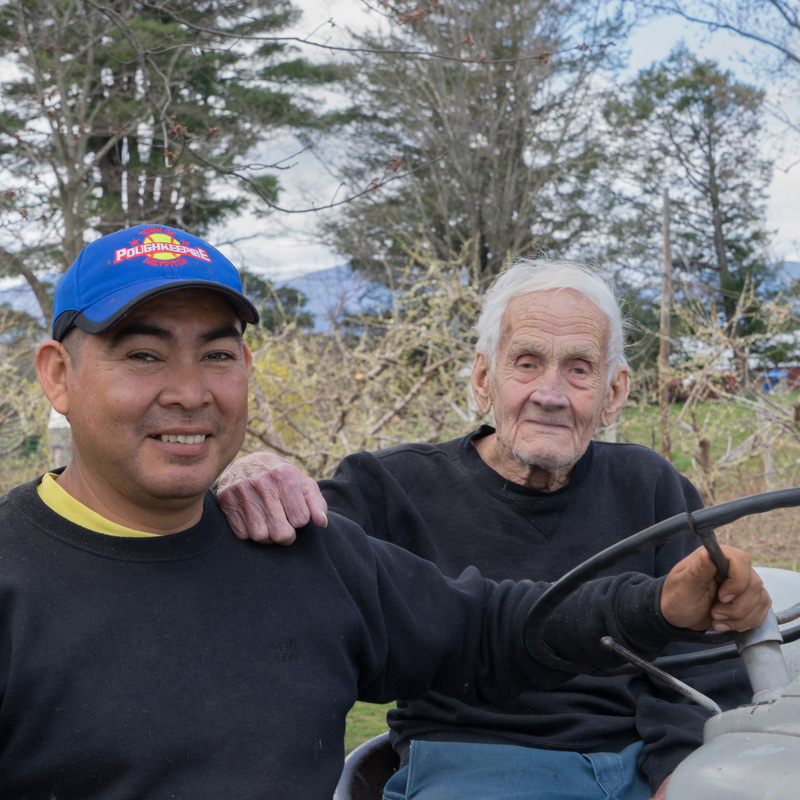 Claude Potts, Hudson Valley Farmer, born in 1925, 94 years of age this year, can tell stories like it was yesterday, about how the Hudson Valley was a main food source supplying half the fruit and vegetables for New York City back in the 1930s and ‘40s. Claude tells of when in the 1930s he and his dad, who grew strawberries, would drive down to Tivoli dock to load them on to a big boat. Later on four or five truckers would come to the farm to pick up 25 bushels of apples and 40 boxes of tomatoes to drive down to the market in the South Bronx and receive a commission from Claude. Sometimes the bushels would bring in only $3.00 per, and depending on the supply and demand as much a $5 or $6.00. The Potts family farm dates back to the 1820s. The Potts ran a general type of farm on about 80 acres off Route 9G growing fruit trees, mainly apples, macintosh and red delicious, along with peach and pear. Tomatoes were another main crop along with other vegetables, and when the weather got cooler the string beans went in. Claude also drove a school bus for 20 years with the Red Hook Central Schools and for Bard College for 30 years. Come Saturdays he would load up the Bard students into the bus by 9am to head over to the Catskill Mountains for some hiking. Today Claude’s daughter Claudia and her husband Don Stickle, married for 39 years, with a wonderful family have taken on the challenge of running the farm. Don’s expertise is in organic beef farming, breathing in new life while maintaining the family tradition of providing a livelihood in food production. Don, as any farmer knows, has to keep up with the demand and understand how to bring his product to market. Thank you Claude Potts for your hard work to preserve our great land and our traditions. ages 6, 5 and 10 months. Victor has been working on the farm since 2012, 40 hours per week. That is the maximum he is allowed to work for Don Stickle. Víctor has his own side business of lawn maintenance and yard work (845-233-0706 or 518-751-8227) and works about 60 hours a week in total. From 2002-2010, Víctor worked in construction, concrete and metal, and has experience with operating heavy equipment. This of course is a benefit to him if the need should arise for other work. The family treats him well. He says, “Although operating heavy equipment pays better, I prefer the farm; it is a big opportunity with a place to live, also including heat and electricity.” In addition, he also has twenty hens and fifteen chicks with one rooster so that he can increase his income for his family.